If you want to search by Business Name, Officer Name, or Registered Agent, you can narrow down your search by using radio buttons However, searching by Control Number, Officer is the easiest way to give you results directly. Below is a step by step process on how to search for a business entity in the state of Georgia. 1. 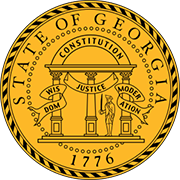 To access the Georgia business search page, click here. (it will look similar to the screenshot below). 3. Click the "Search" button; the Results Page will then appear with a list of entities containing the given name and their respective details. To access more information on an entity, you can click their name. 4. Here you can then see the details of the corporate record for the Georgia business entity. The screenshot for the results of the Business Entity Name "Exide" shows as follows: Corporation Name, Business Type, Control Number, Effective Date, Jurisdiction, Principal Office Address, and Registered Agent information. The Georgia Secretary of State is one of the highest government offices in state and performs several duties. Apart from being the keeper of the State Seal, the Secretary of State of Georgia is also a custodian of the state flag, signs and symbols. The current Georgia Secretary of State is Brian P. Kemp.